Ian Cuthbertson and Thomas Corbett were childhood friends and as teenagers worked together at Ian's father's company, Newbridge Candleworks. 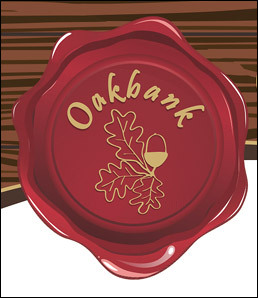 Thomas left to pursue his own career after a few years, while Ian stayed working with his father until forming his own company, Oakbank Products. In 2009, Thomas returned to work with Ian on the development of a new sealing wax that was to be more durable and not crack or break. 2012, As the business was beginning to grow and new clients were appearing, Pauline Corbett came on board to handle finances. When in 2014 Ian Cuthbertson died, his son Roddy became a partner in the business and the company continued to go from strength to strength, building valuable and strong relationships with clients, including Glenmorangie, Sipsmith, Edrington and Chivas Brothers to name just a few. What do you think differentiates the products you design from others on the market? Our wax has flexibility and durability that is difficult to find with sealing wax. There is no sticky or tacky feel and it is easy to work with. Our wax has solved the problem with traditional wax, which is a lot more brittle and could break and end up in the spirit. The vast majority of work we perform for clients is bespoke work. A client can come to us with a pantone number for us to match to, once we produce a wax in this colour, we store the details and the colour is exclusive to this person or company. Sometimes, we receive enquiries with no pantone information, with a situation like this, we simply ask for a label or something the client would like the wax to match. How important do you think the wax and work you produce on site for prestigious limited bottling is to the success of a product and why? Bottle sealing wax adds a prestigious and exclusive look to a product. It can be hand dipped and hand stamped with the company logo, crest or other information, which results in an aesthetically pleasing end product. Depending on colour choice, our wax can add a warm, rustic, traditional look to a bottle, or a modern, sleek look with the inclusion of metallic colours. We have just received the keys for new premises, which is around six times the size of our current unit. This is to account for our rate of growth, which we are hoping will continue to increase. We expect to see our wax on more and more supermarket and retail outlet shelves as we expand. We have made the bottle sealing wax more accessible to larger production runs, as opposed to short runs and limited editions. What new projects can we look forward to seeing on shelf in 2016? Once we are settled into our new unit, we have our sights set on expanding our product range towards the hobbyist and microbrewer community by providing everything needed for creating small batches of sealing wax (dipping equipment, wax melters, pigments).